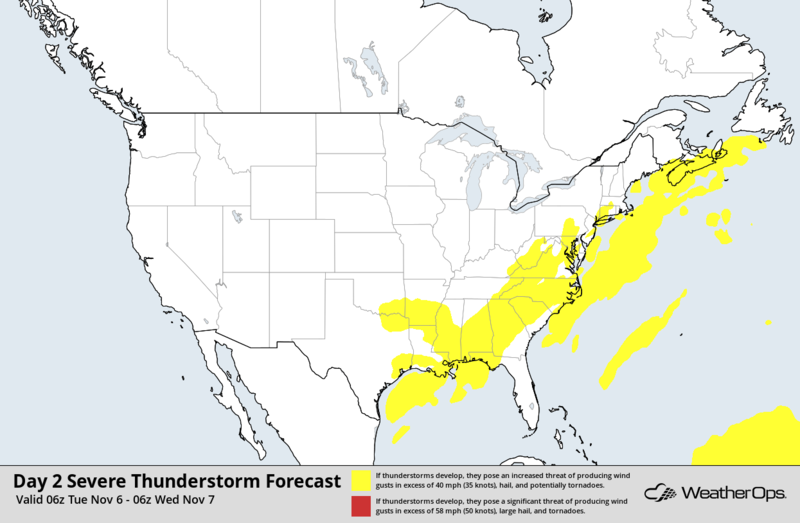 Those voting on Tuesday up and down the East Coast and into the Appalachians will likely need to have an umbrella handy and a plan to seek shelter if severe weather occurs. An elongated cold front will track through these regions throughout the day, allowing for the development of showers and thunderstorms. A narrow line of showers and thunderstorms looks to greet those who choose to vote early in the morning from New York southwestward into the Virginias, western parts of the Carolinas and the western portions of the Southeast. The ingredients for severe thunderstorms will be somewhat limited due to the time of the day, so the main threat will likely be rainfall and occasional lightning. As the front progresses eastward later in the day, the threat for severe thunderstorms will become greater across the Northeast Megalopolis and southward into the central/Eastern Carolinas and Southeast. Daytime heating in these locations will allow instability to increase through the afternoon, resulting in the development of a squall line capable of producing damaging winds and perhaps a few tornadoes along its leading edge. Small hail and frequent lightning will also be threats. Elsewhere, clear skies and mild temperatures will occur across the majority of the Plains. Snow will be possible across the Intermountain West; however, amounts will be light, and significant travel issues are not expected. Finally, mild temperatures and no precipitation can be expected along the West Coast.